Yes, the Mario Williams experience still lingers with me. Played great for a few games, got injured, played meh, got injured again, rinse and repeat. We're better off drafting Oliver than betting a huge contact on Clowney. Giving up anything of value for Clowney would be a mistake. Paying him would be bad enough. Yeah well tell that to Nate and his zombie army. I'm getting burnt to a crisp. That guy is diving into Twitter a little too deep, like you can't be a media star without coming down hard on anyone who disagrees with you. As good as he is, I just don't see deals like this fitting the mold of a perennial winning organization. Shaw! Players love Buffalo. It's a no brainer he would sign here. Give up a top 10 pick to over pay a free agent.. No thanks!! But Clooney is so dreamy the offensive linemen would probably just stand there and admire him while he had a free shot at the QB. Yeah, I’m in the just draft an edge rusher at 9 camp. It’s definitely the play here. That's a great way to put it and definitely how I see it. I hear you, and I don't disagree. 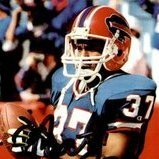 But if the Bills want to do business there is a price to pay, one way or the other. I'd rather pay up front than backload money. That causes more trouble: see Clay, Charles and Dareus, Marcel. i have a different view vs the group on this one. Clowney has been to 3 consecutive probowls in 4 yrs of play (not counting his lost to injury rookie season). hes 26 years old. Not only is he consistent at a good level, he also has game changing ability. Our defense is very solid and adding a playmaker on the defensive side of the ball could put it way over the top. The proposed trade would finish off the defense and allow the team to keep stockpiling young offensive talent around JA. A flip w HOU for Clowney would allow us to take Fant or Irv Smith, or one of the WRs. We also could jump up from that spot and back into the teens if one of the OL (Jonah Williams please!) or Hock slid for whatever reason. Some have said in a draft w this much DL talent, why would you do this? You would bc we cant trade back from 9 to pick up an extra offensive 1st rounder while still getting a blue chip defender. If we trade back (lets say w OAK), we would be looking at a 2nd tier DT, where as with this scenario we would net a pro bowl end who can be moved around on the defense. From a flexibility standpoint, this helpos us bridge the gap past Lorax or allows us to move on from Shaq if needed, so helps us deal with turnover beyond just this next year. we have tons of money to spend so i dont think griping over value applies here. As long as JA remains on his rookie deal, we should have plenty of $ to spend for the foreseeable future. When JA comes off the rookie deal, you can let Clowney move on or you can at that point start getting home town discounts on people staying bc we hopfully will be in the perennial SB contender list at that point.